Please allow 2-4 weeks delivery time on all iceshanty orders. 1 Special Issue Iceshanty Militia Bumperstickers. PM box increased to hold 100 messages. Private board for IS Militia members only. Ability to post items in the For Sale board. 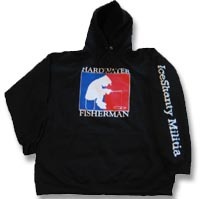 To order: Please select your hoodie size and style and Iceshanty Forum username. Click the buy now button. To order: Please select your cap style and Iceshanty Forum username. Click the buy now button. 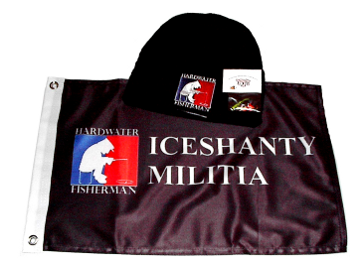 To order: Please enter your Iceshanty Forum username then click the buy now button. Enjoy the following extra features on the forum. BY ORDERING FROM THIS SITE YOU ARE AGREEING TO THE FOLLOWING RETURN POLICY: You may return your purchase for any reason within 10 days after receiving your merchandise for Refund Or Exchange Only. All items returned must be unworn, unused, and in their original condition with the tags still attached. ALL SHIPPING IS NON-REFUNDABLE. Freeman Enterprises is not responsible for misuse, mishandling or any other actions or inactions attributable to the purchaser and or carrier (United States Postal Service, UPS etc). Please allow 2-4 weeks delivery time. ©2006- The Iceshanty Militia. All Rights Reserved.